Kiwi was Anne’s first dog that was all hers (and not just a family pet). She came to us as this little spitfire of a puppy from Santa Ynez Valley. From day one she was athletic, very smart, a quick learner and very devoted to Anne. Kiwi loved to play with tennis, racket and soccer balls and was also a very talented Frisbee catcher. Kiwi enjoyed walks on the beach, romping the trails of the bluffs in Goleta and afternoons at Girsh Park. She was a natural at Flyball and took to the sport instantly. When Anne wanted to give agility a try, Kiwi was a wonderful student as well as teacher. Anne and Kiwi learned agility together from the beginning and Kiwi was a serious competitor, always trying so hard to do her best with each run. 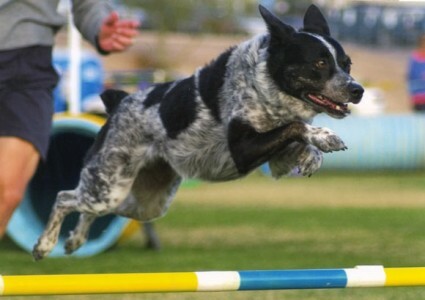 Anne and Kiwi developed from casual agility students to competitive partners at local trials and eventually venturing to the Cattle Dog Nationals in 2004 and the USDAA Agility National Championships in 2004, 2006 and 2007. Kiwi loved her folks Anne and Mike and raised puppies Zip and Kylie—passing on her natural enthusiasm for life and her love of play with toys and her siblings. Kiwi was Anne’s constant shadow and companion and made her affection known through many kisses and simultaneous squeaks. Kiwi was one of the founding dogs of Goleta Valley Dog Club. Kiwi will live forever in our hearts, is thought about constantly and will be remembered for the love she gave so generously to her family and friends. Anne was fortunate to share her life with such an incredible girl, we will miss you Kiwi!